Phoenix, AZ—I just had to have one of these things when I learned they could carry my wildly popular high definition GoPro cameras to new heights capturing previously impossible video. I now have the Blade 350 quadcopter that I obtained from B&H Photo. I also now have two GoPro cameras and a large box of accessories including lots of clever camera mounts. Two GoPro cameras are not enough for filmmakers that need to cover every angle. I think I need three more. Amazon.com just announced their plan to utilize drones to deliver packages less than five pounds in 30 minutes to our homes. There are some huge hurdles that may prevent that from ever happening. However the free publicity for Amazon at the beginning of the Christmas season obviously motivated that announcement. A drone was recently discovered being used to deliver drugs and cell phones to prison inmates. One drone owner friend said using his drone in Las Vegas enabled him to peer into various hotel windows to see who was having more fun than he was. In an era where TV news is losing its audience to bloggers and other Internet sources drones can cheaply and easily obtain video images that only incredibly expensive helicopters could previously cover. The drones can legally be flown at much lower heights than traditional helicopters. Drones for Electronic News Gathering or ENG will become routine. Ranchers and farmers can use the little drones check on cattle and crops with ease. Micro-budgets filmmakers can get those overhead shots from the angles of those expensive cranes and jibes. Of course the angles and heights only helicopters could reach are easy for drones to handle. GPS and operators using line of sight presently guide the new crop of affordable drones. There are remote viewing devices including the GoPros alone sending back live video to tablets and smartphones at a somewhat limited range. 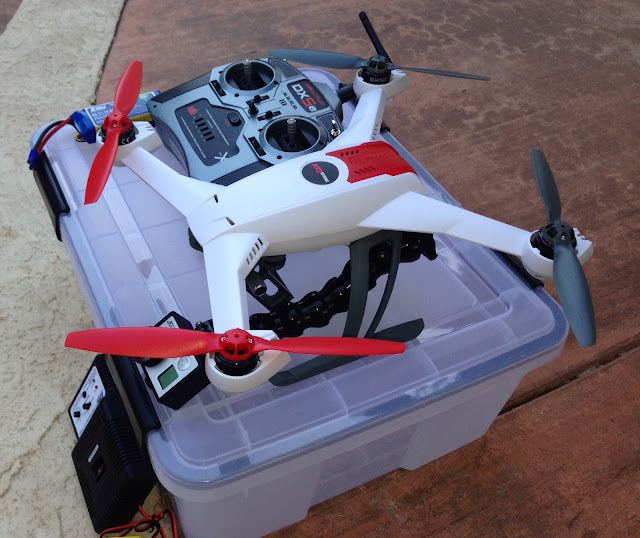 The real estate industry can use these things to obtain terrific aerial images of the properties they're selling. Building contractors can inspect their projects at every stage of development. Mall security workers can inspect and patrol their vast parking lots by drone. Research and development into drone technology is right now in overdrive. A simple small drone with a GoPro or similar camera like mine can be purchased for around $1,000.00. There are bigger and more complex drones with much higher price tags. I anticipate drones will very soon be available that can livestream quality video on the Internet for extended periods for less than $10,000.00 in the near future. We don’t yet know what laws will be put into place regulating drones or how they will even begin try and to enforce them. The survivalists and anti-government crowd were complaining about Big Brother using drones to spy on them. The tables are turning because these same tools can be now be used to spy on Big Brother.